Polyculture polenta flavored by nature. Three Sisters harnesses the brilliant agricultural techniques of Native Americans to produce delicious, nutrient-rich food products. By growing the trifecta of corn, beans, and squash, we mimic the biodiversity found in natural ecosystems for sustainable and resilient crops. Not only are our crops good for the earth, but they also contain complex carbohydrates, essential fatty acids, and all eight essential amino acids, making a highly nutritious and complete, plant-based meal. With Three Sisters Polyculture Polenta, we ground our sustainable corn and then flavor it with our dried beans and squash. Our food products are the best of their kind and, thanks to our polyculture growing methods, taste like no other. The Three Sisters are corn, beans, and squash, crops that Native Americans have been planting together for over 6,500 years to sustain themselves and the planet. Growing them together mimics the biodiversity found in natural ecosystems, and results in delicious and nutritious food products, including our Three Sisters Polenta. Gone are the days of monoculture, the predominant industrial agricultural method of the pre-21st century, which robbed the soil of nutrients. Our food products cultivate biodiversity to grow food that’s naturally sustainable and resilient. Here’s how it works: Corn creates a sturdy scaffold for beans to climb up as they grow. As beans flourish, they deliver valuable nitrogen back into the soil that further encourages and supports the growth (or production) of corn and squash. Squash spreads across the ground as it grows, providing cover from the sun that inhibits the development of weeds and acts a living mulch, maintaining moisture in the soil. Sharp hairs on squash vines further deter pests. The Three Sisters is as beneficial to the planet as it is the human diet, and our products are as delicious as they are nutritious. Three Sisters Polyculture Polenta begins with our sweet corn, which is dried and ground to form the instant polenta base. Then our beans and squash are delicately dehydrated and added to the polenta for big flavor. Corn, beans, and squash contain complex carbohydrates, essential fatty acids, and all eight essential amino acids for a complete, plant-based meal. No matter which product you try, you can enjoy it knowing that you’re getting maximum nutrients packed with unmatched flavor. 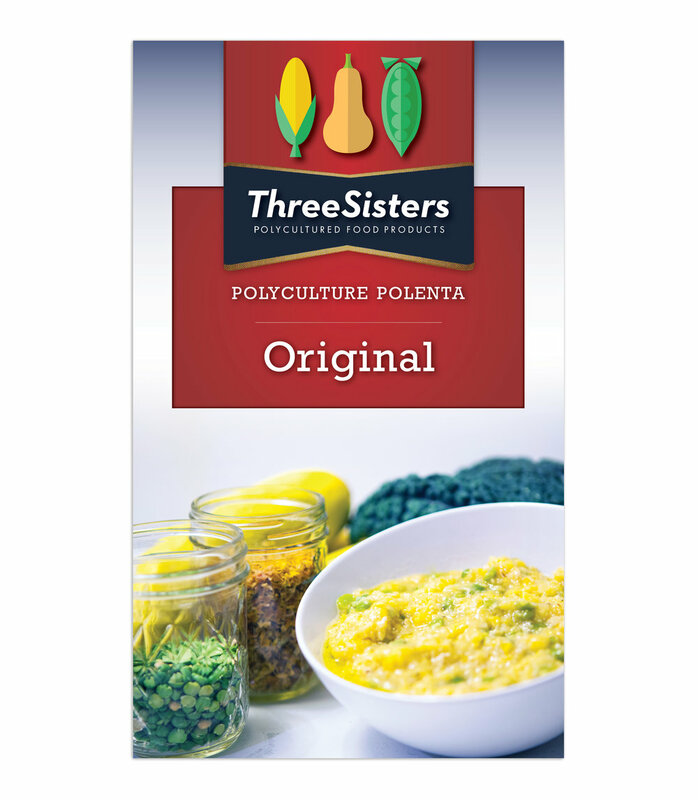 Three Sisters -- Polyculture polenta flavored by nature. Three Sisters were inspired by the following movements, technologies, and trends in food today. Agrobiodiversity: A measure of the diversity of organisms in an ecosystem. In nature, where biodiversity exists, the system is typically more resilient to threats such as disease and pests. The Food and Agriculture Organization of the United Nations defines Agrobiodiversity as, “The variety and variability of animals, plants and microorganisms that are used directly or indirectly for food and agriculture, including crops, livestock, forestry and fisheries. It comprises the diversity of genetic resources (varieties, breeds) and species used for food, fodder, fibre, fuel and pharmaceuticals. It also includes the diversity of non-harvested species that support production (soil microorganisms, predators, pollinators), and those in the wider environment that support agro-ecosystems (agricultural, pastoral, forest and aquatic) as well as the diversity of the agro-ecosystems."